Lose That Girl: WANT IT! Build-A-Bear United Stylee! Surprise, surprise! I had no idea that the fabulous Build-a-Bear Workshop had set up shop in the UK. D'oh...they're all over the US and in Canada so one would think they'd be overseas as well. And look what I uncovered....they have Manchester United kits for their furry friends!! Over here on the other side of the pond, you can get all sorts of North American sporty outfits and yes, I must admit that I did buy a Toronto Maple Leaf jersey for my frog that I lovingly created in Manhattan a few years back. 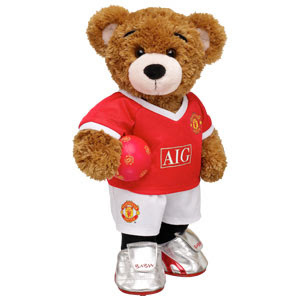 Because soccer isn't that big a deal over here, I had to get a generic Build-a-Bear footie kit but now....I see that I could order some United gear for him!! They have all sorts of bits & pieces. And if you cheer for one of the *other* sides, they have goodies for you too. I had to laugh when I saw the Chelsea kit ...on a monkey! Fitting, no!? They even have Build-a-bear in South Africa! But I never saw any Arsenal kits. If they did, I would've made one.